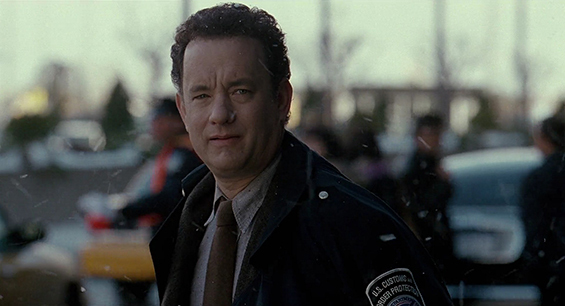 Viktor Navorski (Tom Hanks), a man from an Eastern European country arrives in New York. However after he left his country war broke out. Suddenly Navorski is a man without a country - or one that the U.S. cannot recognize, thus he is denied entrance to the U.S. However, he also can't be deported so he is told by the Security Manager that he has to remain in the airport until his status can be fixed. And also Navorski doesn't speak English very well, so he cannot talk to or understand anyone. 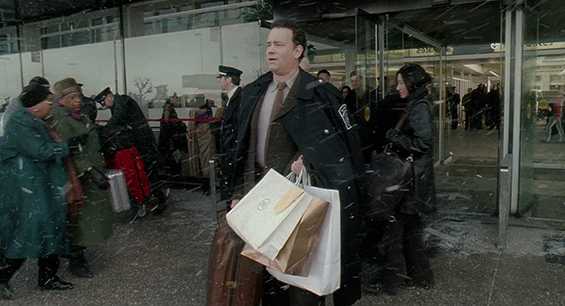 But he somehow adapts and sets up residence in the airport, which makes the man who placed him there unhappy, as it seems he is in line for a promotion but Navroski's presence might complicate that. So he tries to get Navorski to leave but Navorski remains where he is. Navorski makes friends with some of the people who work in the airport and is attracted to a flight attendant he runs into whenever she comes in. otsoNY Comments: There are many films based in New York City, but are often filmed in other States or countries. 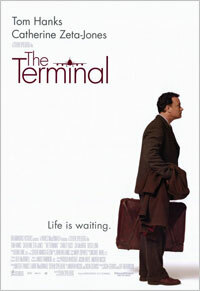 The Terminal is a perfect example. Normally, the main reason is to keep costs down as it is very expensive to film in Manhattan. Director Steven Spielberg travelled around the world to find an actual airport that would let him film for the length of the production, but could not find one. The Terminal set was built in a massive hangar at the LA/Palmdale Regional Airport. The hangar, part of the US Air Force Plant 42 complex was used to build the Rockwell International B-1B bomber. The set was built to full earthquake construction codes and was based on the Düsseldorf International Airport. The shape of both the actual terminal and the set viewed sideways is a cross section of an aircraft wing. Everything functioned in the set as in real life. There was real food, ice cream and coffee in the appropriate outlets. The escalators were purchased from a department store that had gone bankrupt. Each of the outlets featured in the concourse building was actually sponsored by the real company. Many stores are seen and Viktor seeks a job at Brookstone and the Discovery Channel store. 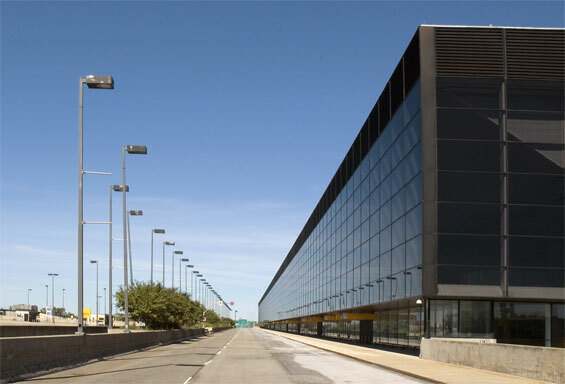 Most exterior shots and those featuring actual aircraft were shot at Montréal-Mirabel International Airport. Additional interior shots were also done there including the mezzanine overlooking the immigration desks and the baggage carousels directly behind them, the jetways showing Aéroports de Montréal signs, and many Air Transat planes in the background, when New York is not one of their regular destinations. 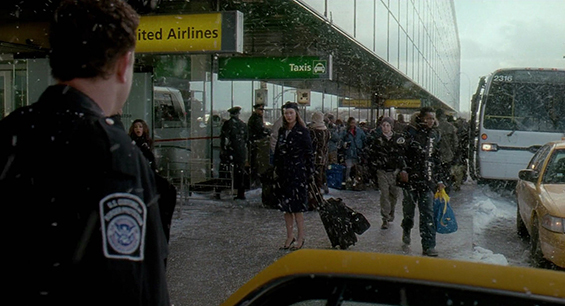 Additional pre-production shooting was done at Los Angeles International Airport and at Spielberg's offices at Amblin. 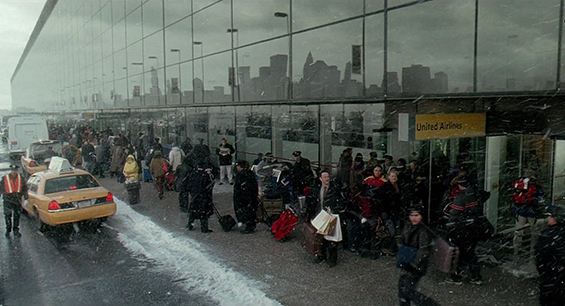 Montreal is also mentioned on the loudspeaker at the beginning of the film, around the point where the customs officer tells Viktor to wait in a special line. The 747 was provided by United Airlines. 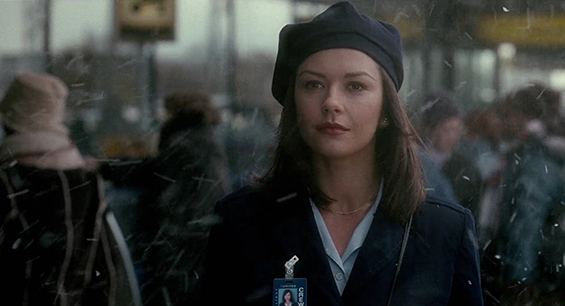 The Star Alliance was a major sponsor and provided uniforms, equipment, and actors in addition to those cast. 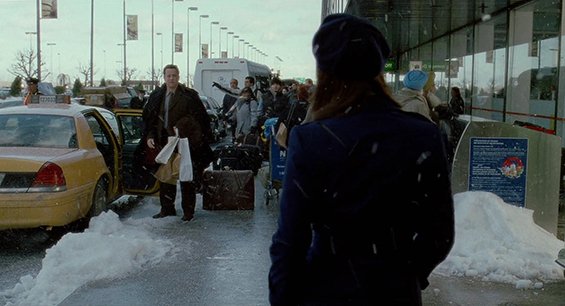 In spite of the heavy presence of the Star Alliance airlines, you can see a Delta Air Lines pilot pass Viktor in a scene during the last 5 minutes of the movie. This is one of the few Spielberg-directed features that did not feature special effects by Industrial Light and Magic. (JFK Airport) Mirabel International Airport, Montréal, Québec, Canada.